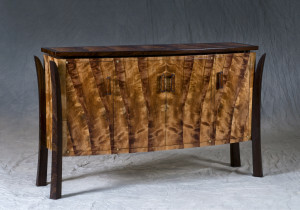 Hawaii’s Woodshow™, Na La‘au o Hawai‘i, is Hawai‘i Forest Industry Association’s (HFIA) annual juried woodworking exhibition, which is held at the beautiful Honolulu Museum of Art School Gallery at Linekona. Attendees to Hawaii’s Woodshow are treated to extraordinary heirloom-quality works made from Koa, Mango, Kamani, Milo, Norfolk pine, macadamia nut, Kiawe and other beautiful Hawai‘i-grown woods. Hawaii’s Woodshow calls for the use of wood from Hawaiian-grown tree species, especially those that have been planted and brought to maturity here in Hawai‘i. It serves as a reference point for the planting of native and non-native high value hardwoods for future generations. Not only does the show encourage an appreciation for the participating artists and the materials they use, but it also promotes the positive role forests play in our economy and ecology. Three Jurors are selected to judge the Woodshow from a broad range of expertise, with one juror being a nationally renowned artist from abroad. Judging is based on “Inspiration of Design” and “Excellence of Implementation.” In the initial round of judging, each judge selects multiple entries from each category creating a pool of entries from each category, from which the First Place and Honorable Mention Awards are selected. Other awards typically include: Career Recognition Award, as many as five First Place awards in various categories, Honorable Mentions, Spirit of the Show Award, Kent Award, Artist’s Choice Award, and People’s Choice Award. Display heirloom-quality works made from Koa, Mango, Kamani, Milo, Norfolk pine, macadamia nut, Kiawe and other beautiful Hawai‘i-grown woods. Serve as a reference point for the planting of native and non-native high value hardwoods for future generations. Encourage an appreciation for the participating artists and the materials they use. Promote the positive role forests play in our economy and ecology.